Late submittal. My favorites are the spanish bible, and the teen bible (god’s game plan, bottom row). And yes, I know I’m an evil, evil person. There’s actually a bible you can get in Hawai’i that’s written entirely in Hawaiian Pidgin. I used to just write, “God loves everyone, except you!” in the Gideon’s bibles whenever I stayed at a hotel. You have a copycat now. For a second I though those were passports. – been watching too many spy movies. If that’s the case, I’m gonna start putting more Bibles in with the Gideons. THAT’LL TEACH ‘EM! Maybe I’ll just started editing them in the margins. 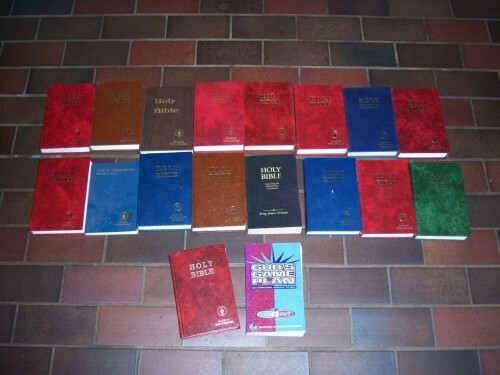 ROFL – I had a collection of Gideon’s Bibles that I had picked up at hotels over the years, I got rid of them about a year ago when I started running out of bookshelf space. I had about two dozen. I hate to tell you this, but they want you to take them.